My local supermarket's weekly flyer announced these at a discounted price so I figured I would give them a try. My thoughts ahead. 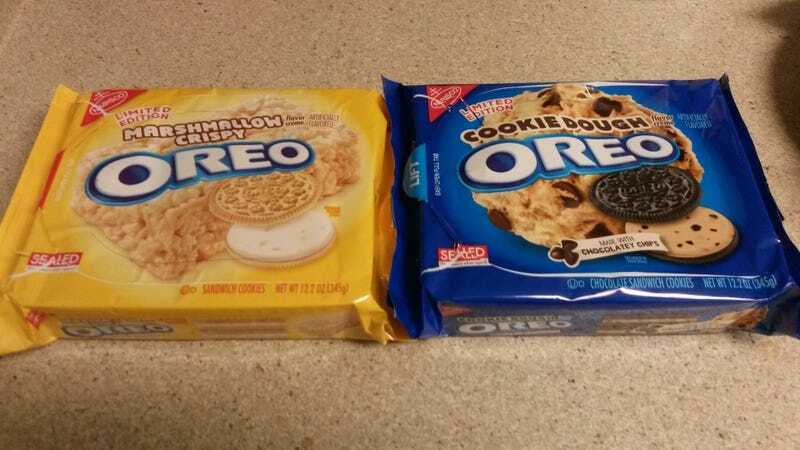 At the supermarket it turned out the cookie dough edition was sold out but I still picked up a package of the marshmallow creme version. Not willing to give up my quest so easily I then traveled to the heart of Mordor and picked a package of the cookie dough version at Walmart. These cookies pretty much taste like a treat made from crispy rice cereal and marshmallow creme. As you might expect it was very sweet. These cookies have a fake chocolate dough tasting filling. Along with the cookies sandwiching the filling it creates a strong chocolate-like taste which is not as sweet as the marshmallow creme. The two versions are distinct from each other. I liked both but can't really say yet which one I prefer over the other. I'll need to at least finish both packages before making that decision. Which one you'll prefer depends on whether you prefer sweet to chocolatey.